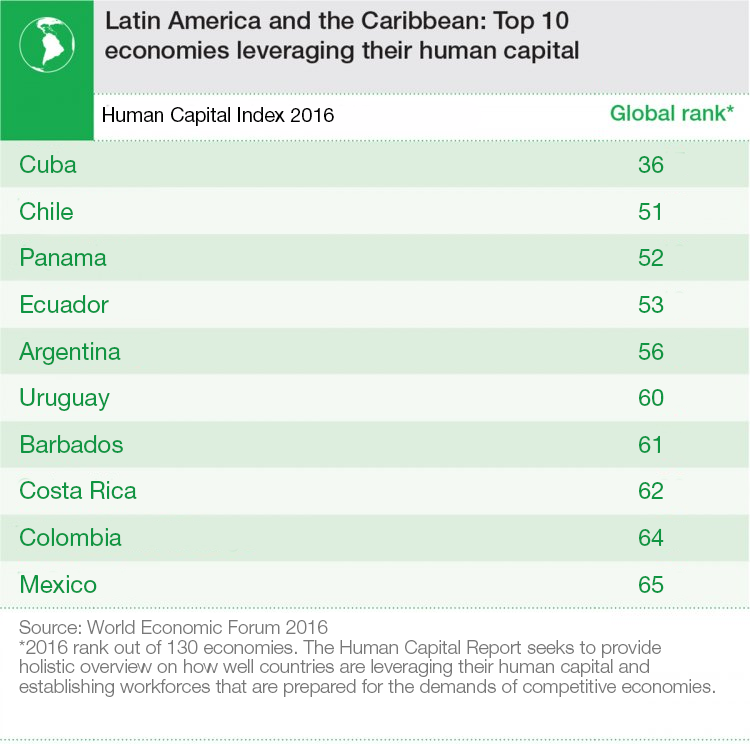 This year’s Human Capital Index covers 24 economies from Latin America and the Caribbean. Key economies in the region, such as Chile and Argentina, often share similar strengths and weaknesses, and the region scores in the middle range of the overall index. Chile benefits significantly from a well-educated and healthy older population that remains economically active well into the 55 to 64 age band. Its core prime working age population (25-54) boasts the highest tertiary education attainment rate in Latin America – one in three receive a tertiary education – and the young generation currently enrolled in university continues the positive trend. Argentina similarly exhibits high tertiary education enrolment rates. Yet both countries have youth unemployment rates of 15-20%. Towards the middle of the regional rankings, Colombia exhibits a large skills mismatch, with one in three 15-24 year-old Colombians currently classified as over-educated for their work, and with a mere 17% employed in high-skilled work. More than half of all Colombian students graduate in business or a social science subject, while only 4% graduate in natural sciences. Brazil, Latin America’s largest economy, ranks in the lower half of the index, with a poor performance on the quality of primary education for those aged under 15. Local businesses perceive it as difficult to hire skilled employees, although the country scores comparatively better on the quality of its on-the-job staff training and its skills diversity. Countries across Latin America and the Caribbean are increasingly achieving high basic education attainment rates – only four countries in the region have a gap that is larger than 10% for primary school education. Cuba performs particularly well on this dimension. However, education quality scores across Latin America and the Caribbean suggest more work still needs to be done to improve outcomes across the region. Labour force participation in the region begins to decline markedly for those over 55, yet compared to other regions the drop off is not particularly remarkable. In general, the region only has a small gender gap when it comes to women’s labour force participation. The bottom ranks of the region are made up of Venezuela and the group of Central American nations, such as Honduras and Guatemala – where incomplete primary education and child labour remain a problem. 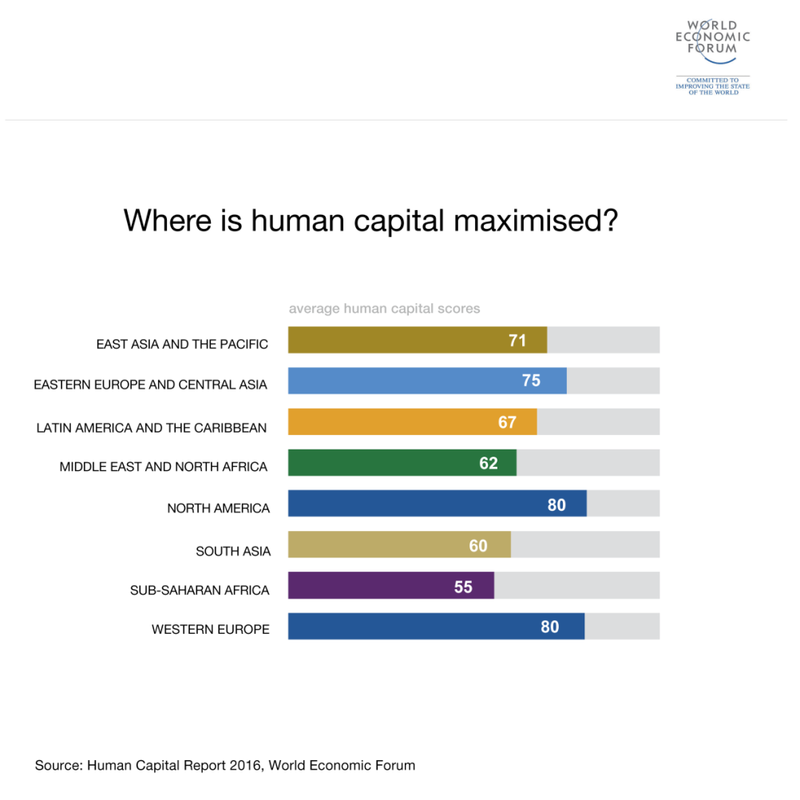 This post first published in the World Economic Forum Blog, on June 28, 2016.